2015 Leaf Draft Rookie Acetate Football keeps things simple. 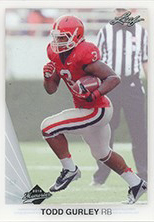 The ten-card factory set highlights some of the top offensive players from the 2015 NFL Draft. Every card in the set is done on acetate. However, the design is probably familiar with a lot of collectors. It's based on 1990 Leaf Baseball. The checklist is led by the top two picks in the draft, Jameis Winston (Tampa Bay Buccaneers) and Marcus Mariota (Tennessee Titans). Besides the pair of quarterbacks, other top-ten picks include Amari Cooper (Oakland Raiders), Todd Gurley (St. Louis Rams) and Kevin White (Chicago Bears). 2015 Leaf Metal Draft Blue Marcus Mariota Autograph #44 50 NM Condition! AMARI COOPER 2015 LEAF DRAFT ROOKIE CARD GEM MT 10 Raiders Alabama RC! 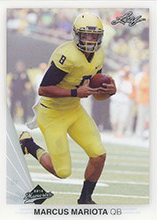 2015 Leaf Draft Special Issue #3 Marcus Mariota ROOKIE Beckett 10 MINT Titans! 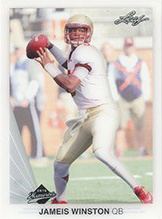 2015 Leaf Ultimate Draft Jameis Winston Auto RC Gold #9 10 SSP Grades High!